When we think about outdoor lighting, we often only think about function instead of how we can balance both function and ambiance. We want our exterior lights to show the way from the driveway to the front door, or come on when an unwanted intruder trespasses through our yard. At Passion Lighting in Grapevine, we love helping people find the best outdoor light fixtures, and we want our customers to have the perfect options for illuminating their yard and also highlighting their house. 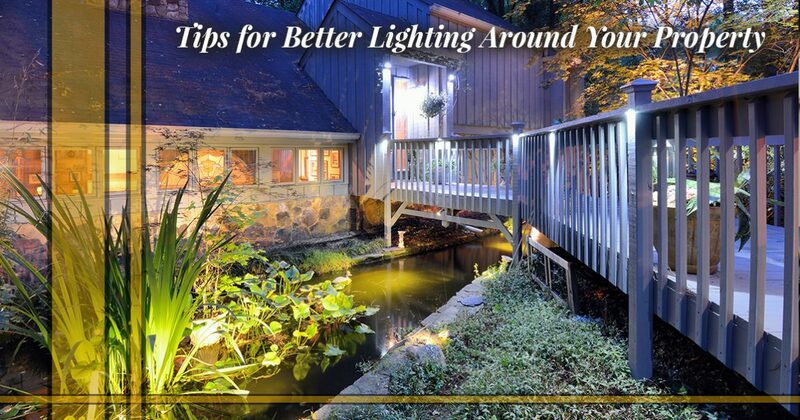 In this post, we’ll look at some tips for better lighting around your property. Every outdoor light fixture has a specific spot and a specific purpose. A hanging porch light above the front door is meant to illuminate the door and perhaps the last few steps leading up to the porch. When thinking about positioning your exterior lights, be sure to consider whether they’re providing direct or indirect light. A motion sensor spotlight is a good example of a direct fixture, as it is meant to illuminate a particular spot in the yard or shine on your back entrance. Indirect light fixtures, such as ground-level landscape lights, are intended to provide a “wash” of light over an exterior wall or particular architectural feature. When adding new outdoor fixtures, make sure that the light won’t shine in someone’s eyes as they approach (unless that is it’s purpose), and that the fixture is positioned correctly so that it can illuminate what it’s meant to. There isn’t as much worry about glare outside your home as there is inside, but you still need to be aware of where a light is shining and how bright it is. The main spots for outdoor lights are above doors, along pathways, and on the side of the house. These general areas often need the most light, but that doesn’t mean there aren’t other spots that could use illumination. Areas such as steps or patios can greatly benefit from light, and well-placed fixtures can enhance your property and make your home more inviting after the sun has set. If you have an outdoor kitchen, a blend of task and ambient lighting can make the space both functional and comfortable. If you have a gazebo or a trellis in your yard, consider how you can add lighting to make the space more attractive and usable. If you use your backyard to entertain in the evenings, you don’t want the space to be too bright or have too much light pollution. This can be controlled by positioning each light properly (as we noted above), by shielding fixtures to concentrate light where you need it, and by using lower-wattage or lower-lumen bulbs in your lights. You can also install dimmers and timers that allow you to control each lighting “zone,” giving you precise command over which lights are on and how bright they are at a given time. If you’re thinking about how you can improve your outdoor lighting, come to Passion in Grapevine today. We have a number of great fixtures to choose from, and we can provide recommendations based on your needs and your budget. If you need design advice, our certified lighting experts will gladly look at your plans, or help you come up with a comprehensive approach to improving your exterior lighting. Our showroom is open Monday through Friday from 8:00am to 6:00pm and on Saturday from 9:00am to 5:00pm. You can stop by during those hours, or you can contact us online at any time, and a member of our team will respond as soon as possible.